When I was working on The Art of Possibility—a book about changing one’s story rather than battling the world as it appears through the lens of that story—I used to go on weekends in fall and winter to a cabin south of Boston to do the writing. The cabin is on a pond, in front of a cranberry bog, and surrounded by acres of conservation land. It provided everything I needed to get my work done: freedom from interruptions, a relaxed atmosphere, beauty, and quiet. As I looked forward to my very first weekend in my recently purchased hideaway I was extremely excited. I was going to spend three days in an environment in which nothing would disturb my concentration. That first Friday morning, I packed the car with the odds and ends of my work, and all the food my dog, Luna, and I would need for the long weekend, and we started off. When we arrived at about 11 a.m., I carted the stuff into the house and responded to Luna’s insistence that we go for a walk. And what a lovely walk it was—the leaves of the oak trees had turned a dark brilliant red, and the grasses along the edge of the bog were shimmering in ecstasy. What happiness! When I returned to the cabin, I put out a bowl of water for Luna, plugged in the computer, brought out my papers, and made myself some lunch. After lunch, when I had done a dish or two and put more things away, I felt a little sleepy, and since it had been a busy week, I felt fine about taking a nap. After my little sleep, I made coffee, and I stared out the window. I noticed that the daylight was fading. In an effort to avoid anxiety around the fact that I hadn’t yet accomplished anything, I turned my attention to the computer. It did not look inviting. But I forced myself to sit down, and permitted myself to play a soothing game of Solitaire as preparation for writing. With extreme difficulty I eked out an introductory paragraph, after which, without any intention to do so, I found myself at the refrigerator. I poured myself a glass of wine, fed the dog, made dinner, put sheets on the bed, and figured there was just time for another walk before calling it a day. A variation of this schedule—a little uninspired writing, a couple of walks, quite a lot of rearranging of papers and books—took hold over the next two days while, under a relatively calm exterior, I became increasingly frantic. By the time I left the cabin, I was in quasi-despair, but ready to try again the following Friday. The second weekend, I arrived steeled to make myself sit in front of that desk. I had several plans for fixing the problem, a problem that I was hoping wouldn’t turn into writer’s block. The schedule was to be this: walk the dog at seven a.m., eat breakfast and put all papers in order before start time, and sit down to work for four hours with one break before lunch. I was to avoid the refrigerator except at designated times. What actually happened was that hardly had I sat down when I was veering away from the computer on one excuse or another. I frequently visited the refrigerator, and several times walked out of the cabin, to the dog’s delight, without really intending to do so. All the power seemed to reside in my headstrong unconscious, rendering my own conscious will completely impotent. At this point it was clear to me that I had genuine writer’s block, just as if it had been fashioned from granite. I called a friend and told her about it, and she tried to help. “Perhaps you are sitting too long,” she said. “Take breaks every 20 minutes.” In my demoralized state I left early on Sunday, beating the traffic back to Boston. Over the third weekend, I hit a crisis point. From my desk in the cabin I shouted aloud, “This is hopeless,” setting Luna’s pointed ears twitching in alarm. And indeed it was hopeless. I was bearing down with my will to overcome a problem I had created myself out of several disempowering narratives. One story was simply that I wasn’t doing what I was supposed to be doing, and another that I had developed “writer’s block.” No wonder I was becoming desperate. I took a deep breath, and gave up. Finally I remembered what my work is about. If I was ever to get down to it, I would be writing about changing the story, not changing myself or battling the world as it appeared to me through the lens of that story, so I called to Luna and left the cabin and took (another) long walk. Prior to this moment, I had had flashes of deep understanding that the world is invented, that it unfolds in the story you tell, so even though I was prone to forget this, I was at a great advantage. My understanding allowed me to “believe in” my reasonably plausible new story. But soon something rather miraculous happened to give it grounding. Memories and evidence that fit the new “adult” story, but not the old “child” one, came tumbling into my mind. For instance, I had heard that our whole bodies absorb about 11 million bits of information per second, but that the conscious mind can process only approximately 16 of them. That’s a ratio in the range of a million to one! Obviously our conscious minds cannot be counted on to process very much. So it seemed clear that writing a book about possibility was probably not going to be done primarily with the few bits my conscious mind would be able to work with. It was going to take the whole of me and then some; and suddenly the new story—“Everything I Do at the Cabin Is Writing”—made all the sense in the world. 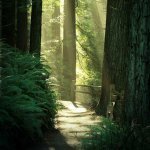 I saw that walking in the woods with all this richness of information flowing in was part of writing. And I saw that letting the unconscious do its processing in sleep was obviously part of the venture, and that the sensual feel of an animal’s fur under my hand was, also, part and parcel of writing. Think of times you have said, “Don’t try to change me, that’s just the way I am.” Capture what you mean by “that’s the way I am,” and what it implies about what you can and can’t do. You will see that it is a story open to revision. List some conditions you are convinced are critical to your happiness—for example, “I can’t really relax until I know everyone is safe (or there is enough money in the bank, or people around me are happy, or I have finished my work).” Note where the story comes from, and how you have memorialized, over time, a condition you were once worried about, or were too young and powerless to change. Notice, too, how disempowered you are by your story. Examine, one by one, the words you are using to define a problem that confronts you. Redefine any words that are causing fear in you, or resistance, or that imply a struggle, until the struggle and fear subside. For example, while guest-conducting an orchestra that was new to him, my coauthor of The Art of Possibility, Ben Zander, felt blocked by a woman violinist whom he saw as resisting him, who appeared to be quite cynical about the rehearsal process. Then it occurred to Ben to examine the word “cynic,” and he came up with a very plausible definition that opened the door to an easy relationship. He declared a cynic to be “a passionate person who doesn’t want to be disappointed again.” From then on he felt entirely aligned with the passionate player in her who was reluctant to give her all to every guest conductor who might foist poor interpretations and shoddy music making on the orchestra. By the time of the performance, all traces of the “cynic” in her had disappeared, overwhelmed by her newly released passion. Examine your political leanings or religious beliefs in the light of the elements in the description of adult and child stories. See whether you are certain that you know the truth (child) or whether you are open to new information (adult). Notice how hierarchical, or fear-based, your convictions are, or how flexible you are in altering them. Our religious and political leaders may be playing to the child in us that craves certainty and right answers. How much better for the leaders of the church or the body politic to have adult partners. Look for elements in situations you avoid that have the ring of the child and lend themselves to being upgraded to “adult.” For instance, if you often declare to yourself (and others) that you can’t take criticism, and find yourself dodging it at all costs, you might notice that your story implies that there are people out there who want to put you down or punish you. There may, indeed, have been those in the past. You may have had a critical parent or been subject to a harsh parochial education. But to keep living within the electric fence of “I can’t take criticism” leaves you a victim in a drama about malevolent authorities. An example of an upgraded narrative could be that what you are labeling as “criticism” is an intimate partner’s attempt to clear the air between the two of you so that you are closer, or a friend’s bumbling but well-intentioned way of supporting you. Widen the frame in your search for an adult story to include what others might be feeling, as well as how your story is related to your ancestry, your culture, or what is happening around the world. Keep at it until you are no longer the hero, or the victim, or even the one who you think is performing the act in question. 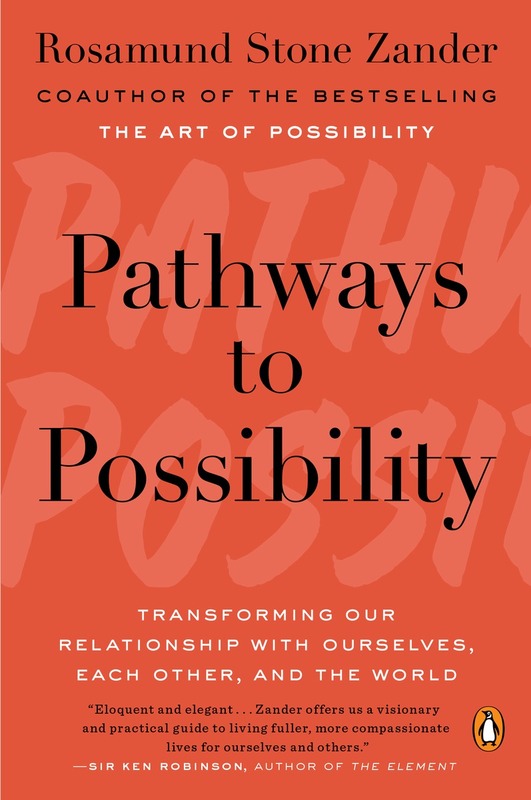 Excerpted From PATHWAYS TO POSSIBILITY: Transforming Our Relationship with Ourselves, Each Other, and the World by Rosamund Stone Zander, published by Viking, an imprint of Penguin Publishing Group, a division of Penguin Random House LLC. Copyright © 2016 by Rosamund Stone Zander. Rosamund Stone Zander is a family therapist, an executive coach, and coauthor of The Art of Possibility with Boston Philharmonic conductor Benjamin Zander.